You have just become a tasty lunch for the purse-web spider. So how does this work? Well, unlike most of the spiders we’re familiar with – those with small, pincer-like mouths that sit in webs all day – purse-webs are a type of primitive spider called a mygalomorph. In this group, the fangs are like a pair of large (relative to the spider) tusks that only move up and down; they don’t pinch, and this feature lends itself to some rather creative hunting methods. Rather than constructing a flat, aerial web designed to have something fall into it, the purse-web spider spins what is essentially a silken tube-sock. 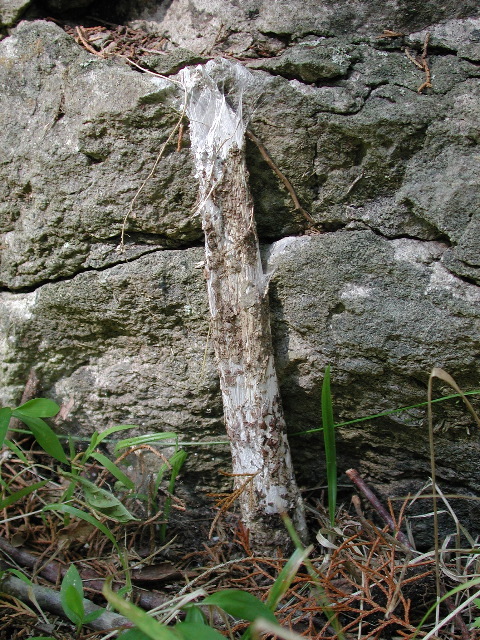 The ‘foot’ of this sock lies along a slight depression in the ground, while the upper part lies vertically against a tree or rock (or, in some species, angles downward into the earth). 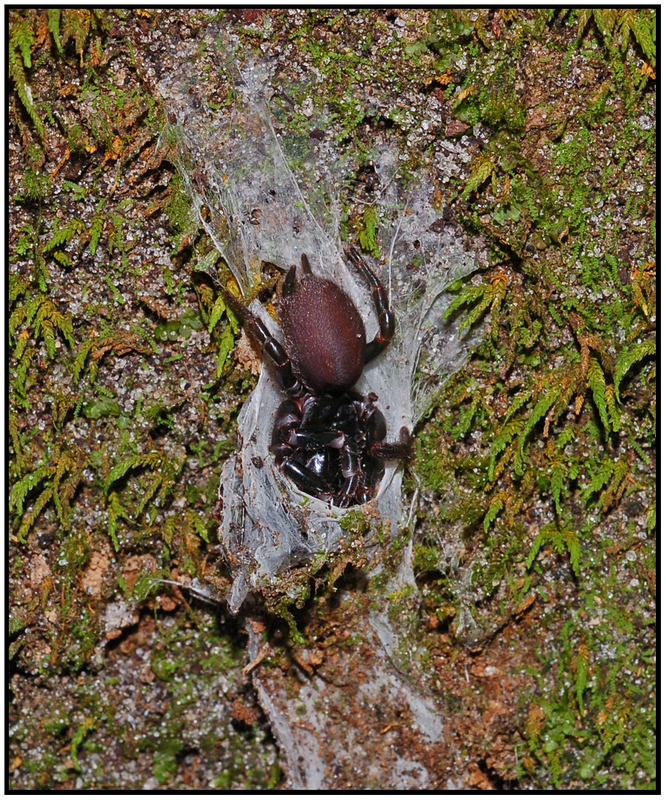 The spider will then place bits of bark and lichen onto both parts of the web as camouflage. Over time, moss will actually begin to grow on the web, completing the disguise. All the spider needs to do now is wait, suspended from the ceiling of her underground lair, for some unwitting creature to walk over it. When this happens, she rushes to the source of the disturbance and spears her prey from below with her fangs before they realise what hit them (like this). Invisible by spider standards, anyway. The spider will be vulnerable to larger predators if she ventures out into the open, so she simply cuts a slit in the web, drags her impaled prey inside, and seals up the hole again. Having sucked out their delicious insides, she then drops the dead husks out of the top of her sock like so much household garbage. In fact, researchers determined the diet of the purse-web spider by noting the various exoskeletons hanging from the outside of the web, having gotten caught on their way down. Apparently, all the dead bodies seemingly stuck to the side of a nearby tree aren’t much of a deterrent to other passersby. 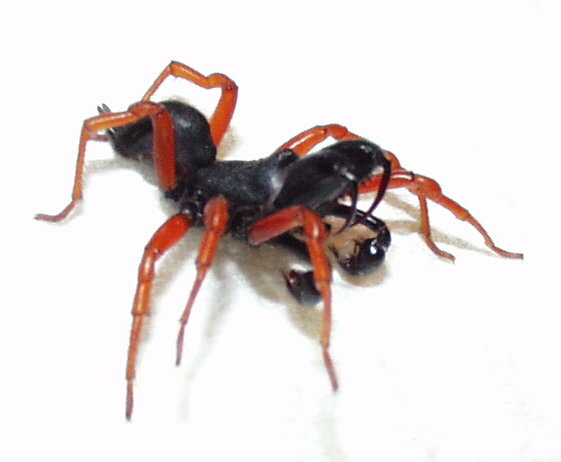 So, since these spiders never leave their burrows, and kill anything that approaches, mating must be tricky, right? Right. The male is attracted to the female’s web by means of pheromones, and ventures out to find it. Once he locates the web, he must be very careful, tapping at the outside of the tube in a way that indicates he isn’t prey. Ultimately, though, whether he’s prey or not will be up to her. If the female inside isn’t yet mature or is already pregnant, she won’t hesitate to eat him when he attempts to enter the burrow. Researchers experimenting with placing male spiders in or near the webs of unreceptive females noted, essentially, that they run like hell as soon as they figure out what’s what. 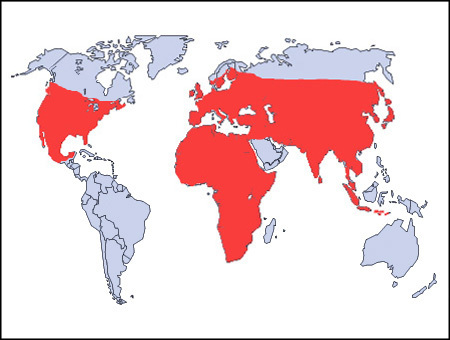 Research is amusing sometimes. A male purse-web spider on what will be either the best or worst day of his life. But in the happy instances where the female is willing to mate, the male enters safely, and in fact continues to live with her for several months of domestic bliss before he dies naturally. And then she eats him anyway. Spiders are not sentimental creatures. Her eggs will take almost a year to hatch, and the young will stay with her for nearly another year after that, before striking out in the world to spin their own tube-sock of death. Piper (2007) Extraordinary Animals: an encyclopedia of curious and unusual animals. Greenwood Press, Westport CT.